For one year, in the mid-1990s, we lived in a rented house in Abbotsford that backed onto a park with a pond and walking trails. That year, my husband studied for his master's degree. This week I was in Abbotsford for a teacher's conference. Thursday was the perfect fall day: the bluest of skies, crisp air, glorious sunshine. Before returning to my parents' home (I chose to stay with them rather than in a hotel), I drove to Ellwood Park for a walk. As I walked, memories of that year came to the fore, memories both good and not-so-good. It was a good year, but tough in many ways. Around the time we moved into the house, a young girl was murdered and another attacked. The attacker was not identified for most of the time we lived there. Our eldest daughter started high school and it was a huge adjustment from the small jungle school she'd previously attended. The entire town was on edge that fall, and I walked her through the park each day to where the path came out on the road, and there were more people. At the same time there was an attack on a woman by an unknown man who entered her home while she was away and beat her when she entered through the door. He was later discovered to be looking for money for drugs. In the small town of Shell, Ecuador, we lived on the grounds of the hospital where Tim worked, along with other expats - Canadian, American, Finnish, Australian, German, New Zealand, and Dutch. We all had our own homes, but it was like living on the same block or two as all of your co-workers. At times the closeness could be too much, but if childcare was needed, or someone was ill, there was a built in community that looked after the needs of its members. In Abbotsford, I was frightened and worried about living in a house where I could not see anyone's front door nor could anyone see mine. There were times when odd noises in the house had me going outside in fear that an intruder had somehow gotten inside. It took several months for me to get used to the isolation in the neighbourhood. All these memories rushed forward as I walked around the pond on Thursday. There were good times, too - visits with family and friends, proximity to services I had missed, such as libraries and well-stocked grocery stores, and the enjoyment of the changing seasons. We were also concerned about our future plans - would we return to Ecuador or stay in Canada? There was a lot of praying and talking, and even a job interview. In the end, we did return to Ecuador, but to the city of Quito rather than to the jungle because of schooling needs for our children. One of the best small things about that year was the park. We walked it together as a family and as a couple. I walked it alone. We walked in the rain and the sunshine. When it snowed we were ecstatic and rushed out to enjoy the event. When spring came we watched the ducklings swim in straight lines behind their parents. Watching the seasons unfold was pure delight. Thursday afternoon was still and quiet by the pond. The geese and ducks were mostly sleeping, or soaking in the sunshine. Light glowed through thinning leaves. Memory - what's brought up memories for you lately? It was so strange to read this today - we have my eldest granddaughter staying for the weekend and she has just returned from an adventure in Peru which she loved. My husband told her about his many trips to various countries in South America when he worked for the UN. One thing that he mentioned was his trip to Quito which he said was the most wonderful and historic city of all the many he had visited on that continent. From your lovely photos it looks as if you too are also going to have a 'flaming' October - if the winds stay calm autumn looks as if it is going to be memorable. What beautiful Fall photos, and what nostalgic memories they bring for you. Being out in nature, walking in the bush or by a creek, always brings back memories of childhood and my hometown in the country. I would love to read more about the time you lived in South America. Your photographs, as always, are stunning. Memories are always swirling for me. I once told my father that I thought about nearly every member of the family, dead or alive, almost every day. He told me, in his typical crisp fashion, that I was nuts. 😏 The fear that that time had for you, and understandably so, would have made an imprint. I don’t know how you made it through except that The Lord was your strength. 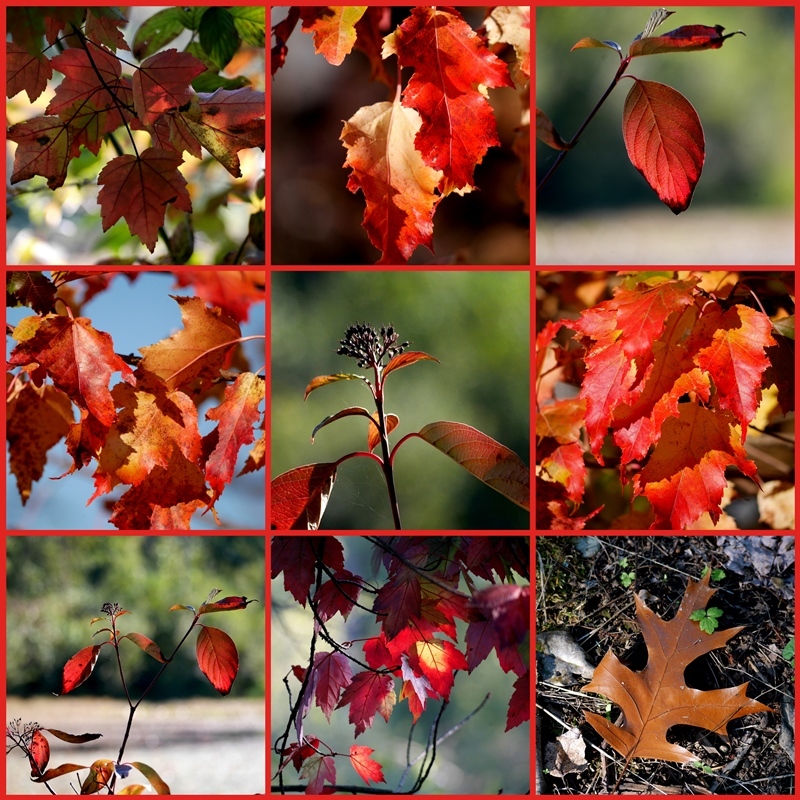 Thank you for that beautiful with all the crimson...except for the oak leaves. Those oak leaves rarely amount to much. Oh, you has lived in Ecuador! Exotic, I suppise that both good and not so good memories from there too. That kind of fear is really consuming, I can't even imagine. Your photos show autumn at its best! Memories, unfortunately have a way of bringing back fears. I pray for peace. You have had some fascinating adventures and lived in some amazing places. So sad to hear about those girls. What great (and not-so-great) memories, Lorrie. I enjoy my memories and often think of the "old days' when all the cousins were alive and we would have huge family reunions. It sounds like your children will have lots of memories to tell their children, too, in the years to come. So lovely to see all of your photographs, and to read about your memories. I find the older we get the more we do look back at times/years gone by. Some years bring better memories than others - that is the way of life isn't it. Winters dressed up for cooler days, walks in the snow, and perhaps building snowmen. Spring with walks in bluebell woods, Summer with fun family picnics and Autumn … such a wonderful season for all the colours that we see, as the leaves change colour enjoying lovely walks with leaves rustling and crushing beneath our feet. Memories are important. I believe they have a lot of influence on who we are. Or, as my Granny would say: That's how you know how you got where you are! She would tell me one day I'd remember shelling peas on her porch fondly and not as a chore. She was a hoot. Thanks for the memories! Lovely post -- in more ways than one...! Lorrie - wow, how difficult that must have been. Anxiety and fear are some of the worst emotions for our overall health, and to live in that environment for an extended period … I am glad you have good memories to counterbalance the not so good. Certainly looking at your photos, it is hard to imagine the area as anything but beautiful and serene. I am especially drawn to the picture with the lily pads and the lone feather. To answer your question - many of my posts are 'memories' in the sense that they happened several months ago, or even a year ago … so I find my mind wandering (in a good way) as I sit down to write these posts. Enjoy your week ahead! One of the reasons I enjoy this month here in Oregon is the memories triggered by the seasonal changes. I enjoyed reading about yours and did not realize you had spent so much time in Ecuador. What a wonderful experience those years were for your whole family. It was interesting that the temporary move back to Canada brought you more fears than you’d had living in Central America. There are good and bad people everywhere. Mostly good. Seems a simple truth that many refuse to accept these days. What a memorable post. Happy Thanksgiving, Lorrie! I think as we grow older memories become more important. I loved reading your memories while walking down the lane. What beautiful memories and beautiful pictures. And yes, Happy Thanksgiving to you. A very ineresting post! And beautiful photos too. Beautiful autumn photos! It's funny how we can feel safer in a foreign country than in Canada sometimes. It is about community. I spent Thanksgiving once in New England and the Maritimes but your Abbotsford photos are just as lovely! Beautiful photos. The changing seasons always remind me of our time In Germany when we were in the Army, we married and then became a parents to three beautiful daughters. Whilst it was a lovely community, there was also a lot of hardship. Bbeautiful photos, Lorrie,enjoyed you sharing your memories. I can only imagine how everyone was so concerned for safety! Thank you for visiting and for taking the time to leave a sweet comment. Great to read your travels, sorry about the violence when you first arrived!!! As my son is now back in the US I know he dearly misses his beloved mexico and his sweet and fun friends. I can see the sadness at times. I am so happy he spent some of his 20s there doing just what he wanted. It seems these periods where you brave souls, live abroad, shape your souls! I know it did his. When you say...one of the best things about that year was the park...I know exactly what you mean. I have walked at Fletcher Park and pondered many different things over the years....some good, some troublesome. I've been there with family but most of the time by myself. It really does bring back memories. We just never know where life will take us. We try to figure it out but it often goes in a different direction. Beautiful photos! Such a beautiful place and I can see why it would be someplace to remember! Living through that time with the disturbing events must have been stressful, though. Sometimes memories can be bittersweet. Lovely photos. I can understand how the memories flooded through your mind as you did your walk in the park in Abbotsford, Lorrie. It must've been a frightening time back in 1990 with all that was going on. I've had memories lately of my mom, who is not doing well, and I have a flight scheduled for next week. It's hard to be far from loved ones. Your post brought back many memories of visits to Shell to visit family there. I can picture the community you mention close to the hospital. Our son was a teacher for many years at the school (NSMS) your children probably attended. Regrettably the school has closed due to low enrollment so our family has relocated to Mexico. I don't expect to ever return to Shell but have many pleasant memories from that spot at the edge of the jungle. I don't blog, but I certainly enjoy yours. You are a gifted photographer and writer~God bless! Dear Lorrie - Autumn tends to bring us into reflective mood. Living with worries and fears is not good thing but I’m happy for you to have had such a lovely park where you often visited. I feel safe and secure in terms of crime in my county but have to be alert about violent aspect of nature like earthquakes or typhoons, so must be well-balanced. The mosaic of luminous autumn leaves is beautiful. Poignant memories, Lorrie. Thank you for sharing them with us. Life so often comes to us in a mix of bitter-sweet. I hope the remembering of it now was more sweet than bitter. Such lovely photos to counterbalance. Lorrie, oh gosh, what scary memories. Did they ever catch the bad guy(s)? I am glad you had good memories too. It looks like a beautiful place to walk. Hi! Your mosaic photo is very very beautiful. I think social gap and difference would become the cause of such terrible cases. Thanks for sharing. You outdid yourself with these photos, Lorrie, they are gorgeous. And it was interesting to read of your adventures. A great post. Ecuador sounds lovely, a friend of ours keeps saying he wants to move there. Your year in Abbotsford obviously brings up the fear of that time. But oddly, after we lived in an enclosed valley for 25 years where no one could see our front door and I was able to turn the kids and later grandkids out to play with no worries, it was when we moved here with neighbors around us that I was fearful at first, keeping doors locked constantly. Now that we know everyone and how friendly they all are, I find comfort in knowing they're around and wonder if it would have been fun raising my children in a true neighborhood atmosphere.